Szerszynski, Bronislaw 2019. Political Geology. p. 219. Sinha, Chetan 2019. Optimizing Millennial Consumer Engagement With Mood Analysis. p. 267. Sarti, María and Barreiro, Alicia 2018. National identity in the historical narratives of a morally questionable historical process / Identidad nacional en las narrativas sobre un proceso histórico moralmente cuestionable. Cultura y Educación, Vol. 30, Issue. 3, p. 433. Hayes, Katherine 2018. The carceral side of freedom. International Journal of Heritage Studies, p. 1. Karnaukhova, Oxana 2018. Memory and Securitization in Contemporary Europe. p. 249. Ahmed, Heba 2018. Partition and the Practice of Memory. p. 175. Fitzpatrick, Esther 2018. A Story of Becoming: Entanglement, Settler Ghosts, and Postcolonial Counterstories. Cultural Studies ↔ Critical Methodologies, Vol. 18, Issue. 1, p. 43. Graezer Bideau, Florence 2018. The Palgrave Handbook of Urban Ethnography. p. 259. Raudvere, Catharina 2018. Nostalgia, Loss and Creativity in South-East Europe. p. 1. Flora, Janne and Andersen, Astrid Oberborbeck 2018. Taking note: a kaleidoscopic view on two, or three, modes of fieldnoting. Qualitative Research, p. 146879411878289. Norbye, Anne-Katrine Brun 2018. Ambivalence and Contradictions: A Case from Mountain Agricultural Landscape Conservation. Ethnos, Vol. 83, Issue. 3, p. 440. Thomas, Nicola 2018. Space, Place and Poetry in English and German, 1960–1975. p. 191. Nets-Zehngut, Rafi 2018. Collective memory of conflict is not all about politics-The Israeli case: Empirical, theoretical, and practical aspects. Conflict Resolution Quarterly, Vol. 35, Issue. 3, p. 275. Xu, Bin 2018. Commemorating a difficult disaster: Naturalizing and denaturalizing the 2008 Sichuan earthquake in China. Memory Studies, Vol. 11, Issue. 4, p. 483. Hou, Song 2018. Remembering trees as heritage: Guji discourse and the meaning-making of trees in Hangzhou, Qing China. International Journal of Heritage Studies, p. 1. Cheng, Vincent J. 2018. Amnesia and the Nation. p. 1. Goddard, Victoria 2018. Discomforting ethnography and contentious biographies: the case of Argentina. Social Anthropology, Vol. 26, Issue. 1, p. 44. Ryan, David 2018. Book review: In Praise of Forgetting: Historical Memory and Its IroniesRieffDavidIn Praise of Forgetting: Historical Memory and Its Ironies. New Haven, CT: Yale University Press, 2016. 145 pp. $25.00.. Memory Studies, Vol. 11, Issue. 2, p. 257. Bartlett, Thomas 2018. The Cambridge History of Ireland. Why are we sometimes unable to remember events, places and objects? This concise overview explores the concept of 'forgetting', and how modern society affects our ability to remember things. It takes ideas from Francis Yates classic work, The Art of Memory, which viewed memory as being dependent on stability, and argues that today's world is full of change, making 'forgetting' characteristic of contemporary society. 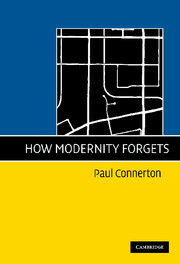 We live our lives at great speed; cities have become so enormous that they are unmemorable; consumerism has become disconnected from the labour process; urban architecture has a short life-span; and social relationships are less clearly defined - all of which has eroded the foundations on which we build and share our memories. Providing a profound insight into the effects of modern society, this book is a must-read for anthropologists, sociologists, psychologists and philosophers, as well as anyone interested in social theory and the contemporary western world.